A close friend emailed this over to me yesterday, and to say I was impressed would be a serious understatement. Pretty much everyone loves the Lord of the Rings movies, and they have been the inspiration for many fan-based projects. Unfortunately most of these are usually extremely low budget, low production value endeavours. This, however, is very, very different. 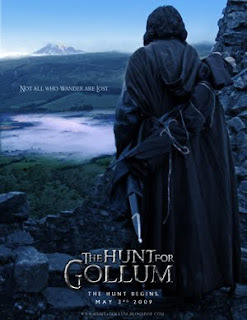 “The Hunt for Gollum”, a movie made by the fans, is a $3000 project that looks as professionally made as many million dollar Hollywood blockbusters. Everything from the lighting to the special effects are extremely good. The script for the movie comes from the appendices of the Lord of the Rings books themselves, pieced together into a coherent movie by writer and director Chris Bouchard. Chris was also responsible for putting together the cast and crew. All filming and post production was done in the UK. The story follows the Heir of Isildur; the "greatest huntsman and traveller in Middle Earth" as he sets out to find the creature Gollum. The creature must be found to discover the truth about the Ring, and to protect the future Ring-bearer. The movie is 40 minutes long and available to watch online for free. I seriously recommend giving it a go.